Intercept3D is an iPhone and Android game developed byFrank Partlic. 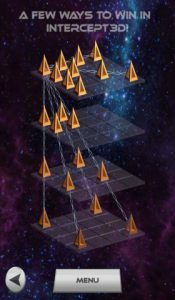 A dreamy blend of Star Trek’s 3D chess and classic kid’s games like Connect 4, Intercept 3D challenges players with four-in-a-row, multidimensional gameplay. Intercept challenges players to place four game pieces in a row. If you get four in a row in a straight line, in any three-dimensional orientation, you win. Just don’t forget to intercept your opponent before they can get their pieces lined up! 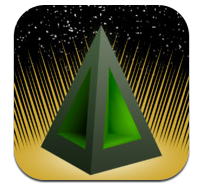 The graphics are simple, yet futuristic, and the game is quite addictive. Controls are nice and responsive, and the overall interface is just plain cool. 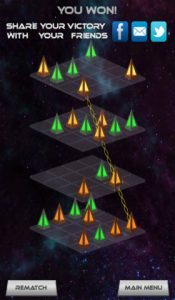 You can share your game results on Twitter or Facebook, and brag that you’re the master of this challenging 3D game. There is both singleplayer and multiplayer game modes, so you can play solo or challenge your friends. You can rotate the game board 360 degrees, to better survey your game and make strategic choices. Add in great sound design, and this is a must-play game! I’ve always been strongly of the belief that the best games, whether they’re board games, physical children’s games, or iPhone games, are the games that are totally simple. Intercept3D is one of those games. Simple as I use it here isn’t meant as an insult. 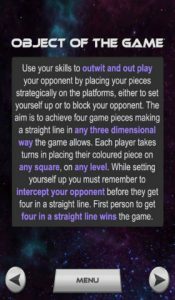 Far from it: while the game is simple, it still manages to be tricky, devious, and endlessly replayable. What more could you want for an iPhone game? 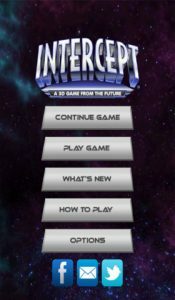 With three levels of difficulty, a brain-bending game board, and simple controls, Intercept 3D gets a final score of 8.5 out of 10. There’s a lot to like here: the game’s futuristic look, the immense replay value, and the low low price. Grab it now! Intercept3Dis compatible with iPhone 3GS, iPhone 4, iPhone 4S, iPhone 5, iPod touch (3rd generation), iPod touch (4th generation), iPod touch (5th generation) and iPad. Requires iOS 6.0 or later. This app is optimized for iPhone 5.